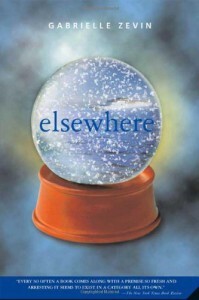 Elsewhere - Books, Books, Books! Elsewhere, now thats where Liz Hall is going. When, after she is killed by a Hit and run. Now in Elsewhere you get younger as the years pass and Liz has a grandma who is about her Moms age. Liz, missing her old life spends all her time watching the people on earth. What happens when Liz tries to contact them. Liz ends up meeting Owen, who was a lot like Liz. What happens to Liz who doesn't want to be here and with her new friends Owen and a Girl she meet. Now when Liz starts to adjust and fall in love for the first time, A unexpected person arrives. It's not someone Liz knows but they hurt her bad. Will Liz hide in her work with finding the dogs new owners or will she try and get back who she now loves.